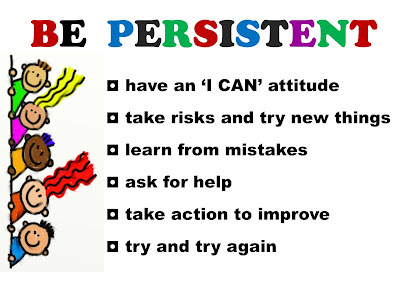 Persistence is the ability to stick with something without giving up. If you practice the how to kick a ball for months before you can kick a goal perfectly, that's persistence! If you practice your 6 times tables for weeks until you know them instantly, that's persistence! This is our focus for the next few weeks. How persistent are you?